As we entered the Carriage House I have to admit I had no idea what to expect from Matt The Knife. Matt is an established Illusionist, Psychic Entertainer, Escapologist, Sideshow Performer and more. Since sideshow has included all of these characteristics at one time or another I had no idea which one he would focus on. Once I stepped into the theater I realized that his performance would be 100% sideshow. Judging by the props on stage and the backdrop of Toni-Lee banners it was pretty simple to figure out what kind of show was coming up. There was a little bit of a twist to begin the show though. As usual, joining me in attendance were fellow staff members Ses Carny and Kim Levesque. When the house lights came up Ses was on stage. He proceeded to deliver a bally that had the audience a bit stunned. Had it been on the midway he certainly would have gathered a crowd. After the applause slowed down Ses stepped off stage and headed for where Kim and I were already seated. Enter Matt The Knife. Matt started off the night with a quick description of what we were all about to see as well as giving us a peek into the history of sideshow. This was a trend that continued throughout the night. Before and sometimes during the acts Matt would explain the origins of the acts he was performing. His first act, which served as an ice breaker, involved breaking a block over his own head. Afterwards he again spoke about the sideshows of days gone by and how each of his acts would pay tribute to what one might have seen on a midway 50 years ago. Next in line was the blockhead. Unlike many performers who hammer nails into their heads, for this act Matt actually hammered a screwdriver into his head. Judging by the crowd's reaction I don't think they quite knew what they were getting into either. Especially when he asked an audience member to remove it! This was another trend that went on throughout the night. Audience participation played a big role in each and every one of his acts. Since I wasn't one of the many audience members he picked throughout the night, I thought it was a great addition to the show. As he dumped his bucket of broken glass on the stage it was pretty easy to figure out what was next. At least I thought it was. When he picked an audience member I figured with the help of his assistant Ciro he would have her stand on his head to complete the act. To help fill the time it took to remove his shoes and socks he and the audience member talked a bit about their weight. Dangerous move when talking to a woman. I thought that may have been the act right there......he'd end up in the glass but no by his own doing. She played along though and he began the glass walk. To my surprise he had the audience member climb on his back while he walked through the glass. I won't repeat her weight, but the combined total neared 300lbs. After he walked through the glass he returned and jumped up and down on the glass while his, not so willing assistant at this point, had a death grip around his neck. The close atmosphere offered by the Carriage House only enhanced the act by echoing the sound of the glass breaking beneath his feet. Next on the agenda was some fun with fire. 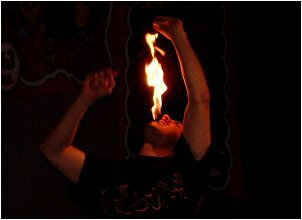 Although fire breathing / blasts weren't allowed he was still more than able to wow the crowd with his fire skills. 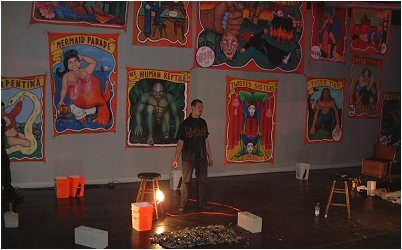 After describing the role of fire in the sideshow he began the act. After lighting the torches he talked to the crowd about the supposed "cold fire." To convince the crowd his fire was actually hot he walked across the front row trying to find someone to stick out there hand to be sure the fire was hot. He had no takers though. First on the menu was fire eating. With the crowd's eyes glued to the torches he downed each of them without a problem. Next was what he billed as the human candle. For this he once again had an audience member join him on stage. With the audience member giving him the count every five seconds Matt held the burning torch to his tongue. He did so for a full twenty-two seconds. Moving along Matt began to explain to the audience the dangers of sword swallowing as the warm-up for his next act. Instead of swallowing a sword Matt decided to use a standard wire coat hanger bent into the shape of the sword. This served as his way to prove to the crowd that the act was in fact real because there was no handle for the coat hanger to fold up into nor was there a blade to roll up as he placed into his mouth. After downing the coat hanger before the crowd he then allowed an audience member to pull it out of him. Judging by the crowd's reaction I don't think there was any doubt as to whether or not the coat hanger ended up where it was supposed to. His next act would bring his escapologist abilities front and center. After searching the crowd a bit he finally found someone to help him slide his way into a straitjacket. This was one of the most comical acts of the night as there are so many things one can say while being strapped in. Especially when the time comes to finish it off with the crotch strap. Once Matt was strapped in and ready to go he began his escape. At one point he even used a stool next to him to assist in getting his arms positioned just right. This wasn't a timed escape but it was entertaining none the less. The final act on the bill was glass eating, or to be more exact light bulb eating. 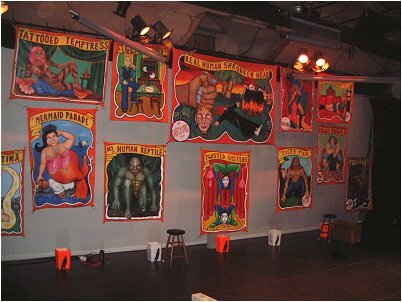 Before doing so he took the time to attempt to give the audience a true history lesson into the world of sideshow. With the bulb lit up next to him in a standard drop light he again looked to the crowd for assistance. The point was to prove that the bulb was real so the audience member took the bulb out and handed it to him after shutting it off and letting it cool. Once the bulb was ready to go he wrapped it in a cloth and broke it with his mallet. He then proceeded to place it atop one of the stools on stage. His first bite set the crowd off as once again the sound of the glass crunching in his mouth was quite loud. Skipping the metal part of the bulb he continued to eat each and every piece of the bulb with the audience shivering at the sound of each crunch. After the show I took the opportunity to take some photos of Toni-Lee's banners which you can see below. We also spent some time in the lobby talking to Matt about the show and he and Ses exchanged some jackpots. To my surprise we also ran into Harry from www.harrymknives.com. If you're not familiar with him Harry has designed a set of throwing knives called the "Throwdini Throwers." And yes, the Great Throwdini uses as well as endorses them. If you check out Harry's site you'll see Throwdini's testimonial. All in all it was a great time and having the opportunity to meet Matt as well as Harry afterwards was a great way to top off the night. If you're looking for a fun night out be sure to stop by and see one of Matt's performances. Judging by his sideshow performance I can only imagine what he has to offer in his many other styles of shows. Be sure to check out his website at www.matttheknife.com. I would also recommend you check out Harry's site and of course Toni-Lee's site at www.sideshowbanners.com.